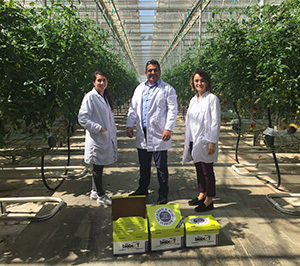 In Turkish tomato production, Sultan Sera A.S. stands out as a leading company of sustainable production. What is so special about Sultan Sera’s approach? Its unique solution in terms of energy supply and energy efficiency, its commitment to broad economic development of the region, a focus on a high quality product with all required certificates for the international market. And last but not least, a dedication to the best solutions in biological control in collaboration with a trusted partner, Biobest Antalya. Due to the innovative character of the project Sultan Sera gained the support of the Dutch Ministry of Innovation. Sultan Sera’s unique approach of course leads to a unique high quality product. The company cluster tomatoes under the commercial name “Tomatolia” and its product is sold in export markets such as Holland, Belgium and Russia. The company holds all the certificates such as ISO 9001, ISO 14001, ISO 22000, Good Agricultural Practices and GLOBAL G.A.P. required to operate in these markets.